This article is about the Big Boo boss from Super Mario World. For other iterations of Big Boo, some of which are bosses, see Big Boo. Big Boo is a boss who first appears in Super Mario World. Despite that, he looks just like a translucent Big Boo, except that he is white in Super Mario World: Super Mario Advance 2 while normal Big Boos are blue. 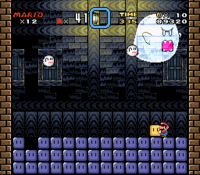 The Big Boo is actually the first notable character to be a ghostly boss. The Big Boo first appears in Super Mario World. Here, he is a hidden boss only found in the secret door of the Donut Secret House, which he inhabits. He has two normal Boos which accompany him in battle. The way he behaves is slightly different from that of other Big Boos: he floats in the air above and around Mario rather than chasing him and does not even stop when being looked at. The Big Boo can only be injured when he is visible, so Mario has to throw a Grab Block at him at the right moment. Once hurt, he puts his hands on his face and becomes almost invisible so Mario cannot injure Big Boo. He then moves somewhere else and reappears with his face uncovered. The Big Boo needs to be hit three times to be defeated. Mario or Luigi can touch the boss without being hurt, but must be wary of the normal Boos. Once the Big Boo is defeated, a new path is revealed on the overworld, leading to Star World. Unlike the Koopalings, the Big Boo is always available to fight Mario anytime by re-entering the Ghost House and going to him. The Big Boo reappears in the Game Boy Advance enhanced port of Super Mario Bros. 3. The Big Boo appears again as a boss who Mario has to fight against. He appears in the e-Reader levels Doors o' Plenty and Vexing Doors, where he plays the exact same role to that of Super Mario World, except this time he could hurt Mario or Luigi by touching him. He is again alongside his two Boo allies for assistance in the same way. However, this battle is notably more difficult than it was in Super Mario World, as the player does not have the ability to kick blocks upward and must jump to the Big Boo's level to kick blocks at it in midair. Instead of using Grab Blocks, Mario must use Ice Blocks and throw at him three times to defeat Big Boo. The Big Boo's appearance rarely changes throughout his video game history. In his debut in Super Mario World, the Big Boo has white eyes shrouded in darkness (except the artwork shows his eyes to be black), a red tongue, and four, vampire-like fangs (a characteristic shared by many Boos in the 16-bit era). His appearance stays the same through Super Mario World. In Super Mario World: Super Mario Advance 2, he is shown to be white, unlike the Big Boo species, which appear to be blue. In addition to possessing the abilities of other Boos (including the abilities to teleport and to pass through walls), the Big Boo can become translucent and less visible so nothing can touch him. He can also reside in places where it is bright. Another difference between him and other Boos he does not fade away when he's defeated but appears visibly and falls down. In Mario Mania, two entries alternatively list "The Big Boo" for the special Big Boo and "Big Blue Boo" for the enemy variant. It is possible that the boss was supposed to have a unique name that was mixed up in localization. ↑ Nintendo Mario Mania Player's Guide. Pages 72-73. This page was last edited on April 5, 2019, at 20:49.